Peninsula-born Chrisie Wendin discovered Menlo Park some 20 years ago through a fortuitous house-sitting gig on Oak Grove. Once married, she settled down to raise her family in the Willows. Chrisie is an award-winning editor who’s been covering business and technology for the last two decades, having “been there” during the heady days of many now-defunct magazines. Currently working at a professional services firm on a custom business publication, Chrisie sees contributing to InMenlo as pure fun. Chrisie has written 62 article(s) for InMenlo. A few weeks ago we reported on the urgent need for donations to the annual holiday party held for students of the Ravenswood City School District and their families. 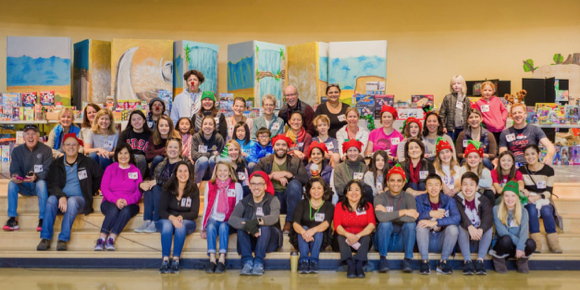 The Willows neighborhood group spearheading the effort had less than a week to recruit volunteers and collect toys, gift cards, and blankets to serve the more than 400 low-income families. Did they succeed? Overwhelmingly so! Here’s the official count from the organizing team: 2,661 toys, including 341 preschool toys, 330 balls, 322 books, 280 stuffed animals, 250 Lego sets, and 120 dolls. They also collected and distributed more than 200 gift cards and 600 blankets. The party was a lively affair, with students in pre-K through eighth grade having the opportunity to “shop” for a gift among the many stations, organized by activity. Santa was on hand for picture-taking, and raffles for bikes (more on that incredible fund-raising effort below), scooters, and family gift cards were held throughout the day. As they exited, families (many of whom are classified as homeless) also received a blanket. The gifts and blankets remaining at the end of the day, were later distributed to families unable to attend the festivities. 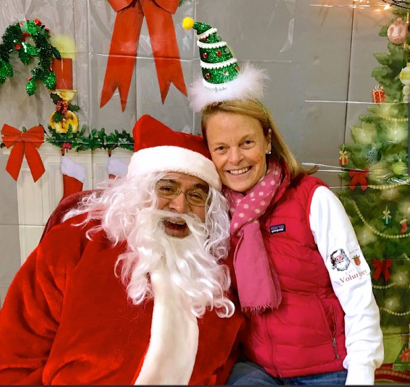 While the smiling kids and parents marked the event a success, for organizer Dana Shields (pictured with Santa), it was just as much about the incredible volunteers and community efforts leading up to the big day. Neighbors, coworkers, local businesses, church groups, school service clubs, and sports groups came together to pull off the event. 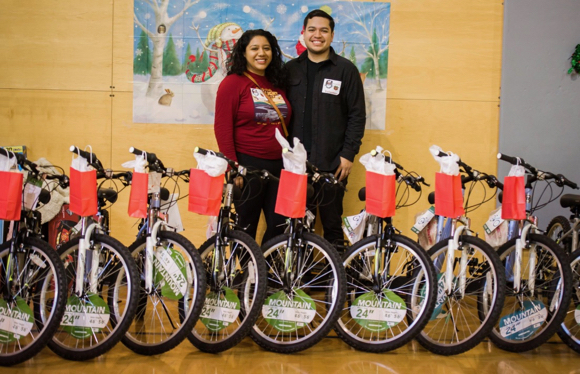 While there are numerous stories of generosity and service among the hundreds of people collecting gifts and the more than 100 event volunteers, below are a few of our favorites. Dan and Patricia O’Brien organized a drive at Ladera Oaks Swim & Tennis Club, as they have done for the past seven years. The effort began with Dan’s Wednesday night tennis group, which in the past few years has donated toys directly to different Ravenswood schools. This year, with the collection effort expanded to the entire club, the O’Briens were thrilled to be able to serve all the schools, and they collected eight barrels worth. 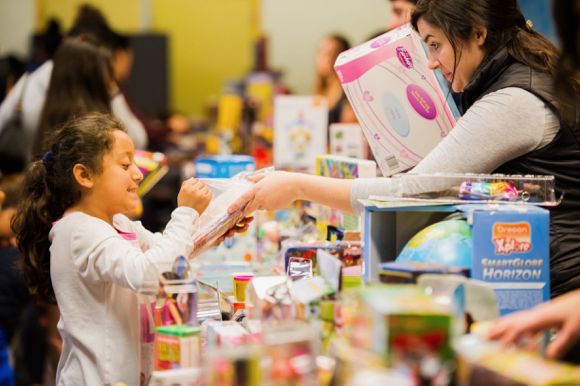 Charlotte Smith, a seventh grader from Woodland School in Portola Valley collected more than 200 toys. Charlotte had volunteered for the Ravenswood toy drive the past couple of years and noticed that each year there have been more and more children. She wanted to make sure there would be enough toys for all the kids who wanted one. She worked with her school’s Service Club this year to make it happen. Missed the toy drive and still want to help Ravenswood students? Donate to the Ravenswood Education Foundation or volunteer with All Students Matter. Toy drive for Ravenswood students extended — 1 more day to help!